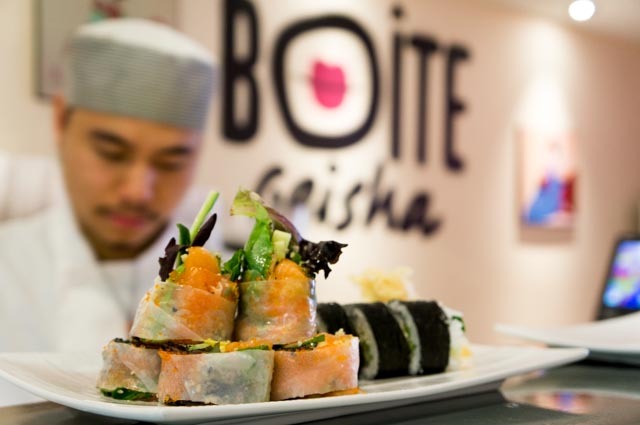 One year ago, Boite Geisha (BG) opened its doors at 1209 Mont Royal Avenue East. The little sushi shop was a short-lived secret for the foodies inhabiting Montreal. Fortunately, for the rest of us, the secret's out. In between David's Tea and Cafe Rico, brothers Viet and Nam are causing a quiet ruckus in Montreal's food scene. Twins Viet (right) and Nam (left) prepare sushi alongside their father. It wasn't easy to open, either. The two saved their money in hopes of opening early June. The odds were stacked against them. With the help of a few friends, they remodeled their entire store, some nights working around the clock. Despite struggling to find all the necessary resources, they found a way to open on the date they had set their eyes on: June 6, 2013. Their risks paid off. Walking into BG, you quickly realize this isn't your typical sushi shop. They do not boast a traditional Japanese menu, nor an experienced Itamae straight from Tokyo. Rather, their style is catered to a more modern palette, to those in search of a unique flavor and experience. The twins, just 22, are the driving force behind this restaurant. The experience they wish for customers to feel is a combination of their outgoing personality and the unique flavors their parents introduced to Montreal over a decade ago. At 10 years old, they were helping prepare sushi for their parents' shop, Geisha Sushi. In hindsight, the hours they spent learning the fundamentals behind making each delicious dish were well spent. Their parents’ have quite a history in the restaurant industry. After immigrating to Canada, they’ve spent their years owning an Asian bakery, a Vietnamese restaurant, a Thai restaurant, until finally finding their niche in sushi. This sundry background influenced the flavors found in BG today. The sushi restaurants of Montreal in their price bracket ($15-25/person) are incredibly similar. Bland atmosphere and copycat recipes left an unquenched hunger for innovative sushi in the city. Viet and Nam want to share with the rest of the world what they believe is some of the best sushi around. The tastes they create draw from influences from the diverse cultures present in Montreal. But, their secret for such addicting flavors lies in the unexpected. It’s all about the sauces and the rice. Everything they use is bought in its simplest form before various ingredients are added. The soy sauce, the vinegars are all modified to compliment the dishes. How exactly they add to these basic ingredients is their little secret. The recipes themselves call for special sauces, like their spicy mayonnaise, that makes for decadent sushi. Creating perfect rice is key, as well. It must be flavorful to be noticed, but simple enough to not distract from the other ingredients all while maintaining a soft composition. Combining these elements makes for a superior menu. Special sauce makes for special sushi. The two brothers love coming up with new recipes and letting their customers try them before making permanent menu changes. Their most requested sushi is Dragon’s Tongue: salmon and tuna tartar combined with marinated eggplant on crispy rice wrapped in seaweed and topped with tobiko. Before pouring their creativity and dedication into Boite Geisha, the twins were actively involved in the b-boy community. The two spent their days perfecting their art and organizing various events. During summertime, their crew could be found throughout the city entertaining tourists and locals alike. In just one year, Montreal has shown that BG is a shop they'd like to keep integrated in their city. A simple Google search comes back with great ratings on all major review sites. “We want to share our sushi with everyone in Montreal because we believe ours is the best. It’s different, it’s tasty, it’s our generation’s sushi” says Nam.